Have you ever wondered that why the biggest and popular brands like Facebook have acquired the Instagram (a company with no revenue) by investing a billion dollars? Probably, the reason could be that it might have observed that the Android App of the Instagram has got a whooping one million downloads within a day. 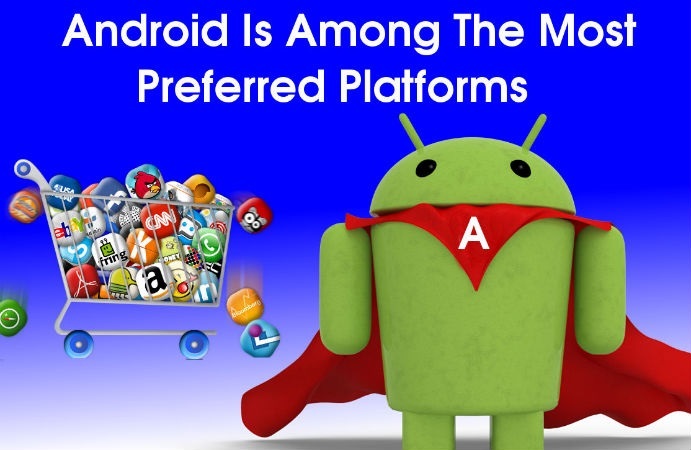 It dictates popularity and huge audience base of the Android platform. Indubitably, the advancement in Android application development and its growing demand bring it to the forefront of mobile app development. It provides incredible features that help it endeavor for a successful platform in the market. The evolution of the Android app development has revolutionized the mobile market. There are truckloads of benefits that the Android application development offers to both its developers and consumers. Let’s have a look at a few of them. Android has improved dramatically over the years and Google makes strive to keep it updated with up-to-the-minute technicalities and superior functions. The Android Software Development Kit (SDK) features a plethora of proficient app development and testing tools. With the virtue of SDK, developers can create and test an Android app over an Android simulator to ensure its smooth functionality and consistent performance before releasing the app in the market. Android being an open source platform allows the Android app developers to review and tweak the code to modify the operating system in a desirable way. Android incorporates Linux OS and offers the source code of the OS or a downloaded app to the developers. This will ultimately help them create a better and innovative application by enhancing its source code. Unlike other mobile app development platforms, Android offers a cost-effective solution. It features a diverse customer base and end users admire feature-rich applications at minimum possible rates or rather free applications. This is why most of the Android apps are available for free or are marked with minimal price. Google has tried to make the Android’s UI as versatile and flexible as possible by introducing customizable widgets. These widgets allow one to easily tweak their Smartphones and offer beneficial shortcuts and dynamic updates for numerous services that can boost their productivity, like social media feeds, email notifications, and a lot more. It delivers astonishing performance when placed anywhere on the Android User Interface. With the open source app development environment, Android allows developers to completely modify the OS and install custom ROMs. This helps integrate improved speed and superior features into apps. There are truckloads of features that has made Android stand ahead of its competitors. Google integrates superior features to this platform and makes it one of its kind. For instance, WiFi Direct, multiple user accounts, WebP images and a lot more. All this updated features facilitate users to reap the benefits of advanced technology and brings world at the fingertips. Being an open-source platform, Android application can target a huge market base. Not only the Smartphones, but any device that is capable to connect to the Android market establish a reliable network can run the Android apps. It thus, helps drive greater conversions and sales, and allows businesses to generate higher ROI. The Google Play store is an official app store that features all Android apps (including both the free and the premium ones). It comes as default in all the Android tablets and Smartphones, so that Android users can easily search and download requisite software. Unlike iOS users that features a locked system, Android users are also allowed access and download apps from other sources like, a third party app store, flash memory card, etc. However, Android doesn’t guarantee the feature of the apps from other sources, thus there is always a certain risk involved while installing an app from any other source. These are some of the compelling advantages of the Android app development that helps it rank above all its competitors (including iOS app development). It is a lucrative and efficient app development platform. The accentuating number of Android app development companies and developers in the market clearly epitomize its positive future outlook. This is a guest post by Lucie Kruger, an eminent Senior Content Editor and IT consultant. You can also contact her, if you are looking forward to hire Mobile Application Developer for premium services. Presently, she is working for Mobiers Ltd, a reputed Mobile Apps development company. I agree with you Nwosu, like you pointed out in numbers 7 and 8, these are very real and the masses are enjoying these features. Thanks for the post. Thanks Emebu for your awesome contribution. The reasons you’ve given here are classical and if I may add, the many Chinese cell phones running it is a huge plus when you factor in their immense affordability. I love open source so much more. I understand why others dont, but Android does have the ability to surpass Apple type innovation.